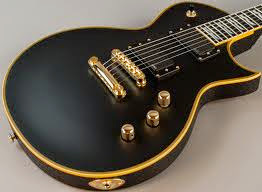 I have not had very many nice things to say about the Les Paul model guitars that have been coming out of Gibson’s Nashville factory in recent years. I think that a brand new guitar that costs thousands of dollars should have level frets and a playable neck right out of the box, which is something they are unable to do. Fortunately there are companies that are building very good alternatives for a lot less money, such as ESP’s LTD Deluxe EC-1000. 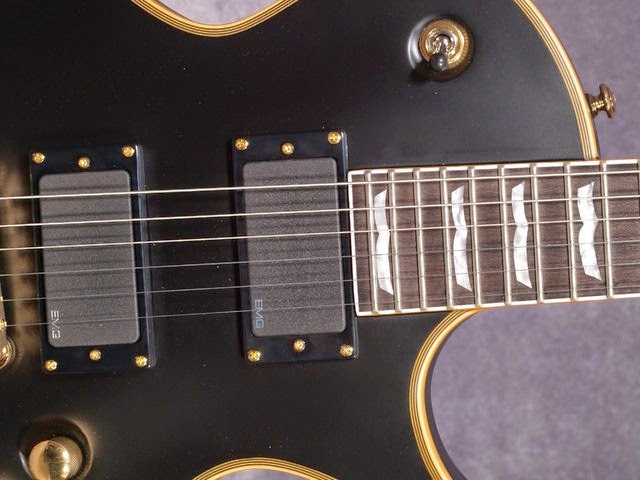 There have not been many legitimate domestic competitors to the Les Paul, and the best copies have always come from Japanese companies such as Tokai, Yamaha and Ibanez. ESP got into the game after all the lawsuits, so their guitars have a different enough appearance that they are not going to get into trouble with Gibson’s legal team, but they hit very close to the mark of what a real Les Paul should be. ESP makes what may be the finest production guitars on the planet, but with Japanese labor and the vagaries of the Yen, you are going to pay a premium to get one of their new guitars slung around your neck. This is where their LTD series come in, as the models are very similar but are assembled outside of the land of the rising sun (Korea), where workers do not get paid as much. Obviously the attention to detail will not be as good, but the LTD instruments are still very good. The LTD Deluxe EC-1000 maintains a Les Paul-like body shape with a sharper cutaway, and a headstock design that will not get them into trouble. They do not come with a tremolo, and come in two flavors: a more traditional Sunburst model with Seymour Duncan pickups or a metal monster with active EMG pickups. The bodies on these instruments are made of mahogany, and are bound, and the models transparent finishes have figured maple tops and abalone purfling around the edges. These guitars are surprisingly light (under 9 pounds), and none of them come with a pickguard. Mounted to the body is a Tonepros locking bridge and tailpiece, which will be black, gold or chrome, depending on the color of the guitar. The ESP website shows a model with a locking tremolo, but I have never seen one in person and wonder if they really exist. The set mahogany neck is wonderful, with a thin U profile. It has the traditional Les Paul scale length of 24.75 inches, but ESP uses 24 (instead of 22) and they hammered in extra jumbo wire. The bigger cutaway makes it easier to reach those extra frets (for those of you who use such things). 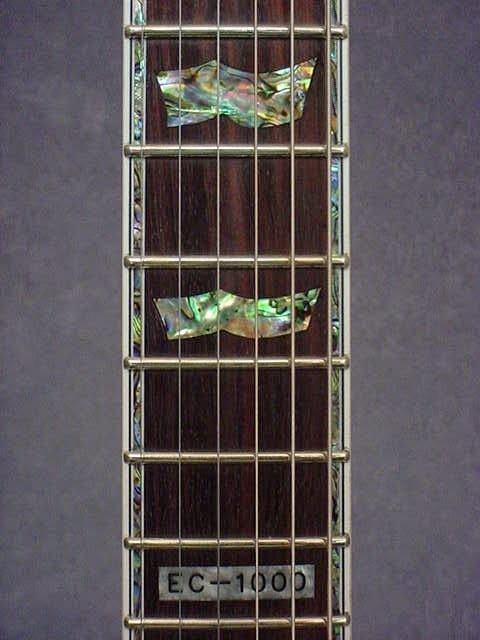 The fretboard is rosewood (or ebony on vintage black), which is a bonus since Gibson is now using some sort of stained maple. 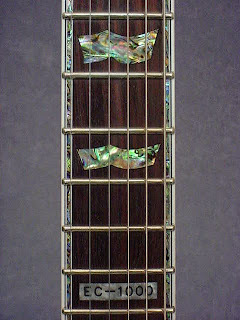 There are really nice mother of pearl inlays, with the model number embedded at the 12th fret marker. 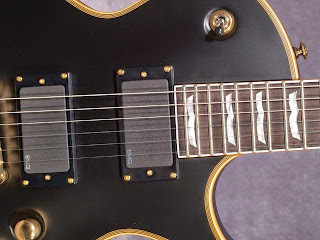 The nut width is 42mm, which is tad skinnier than the 43mm found on most Les Pauls. 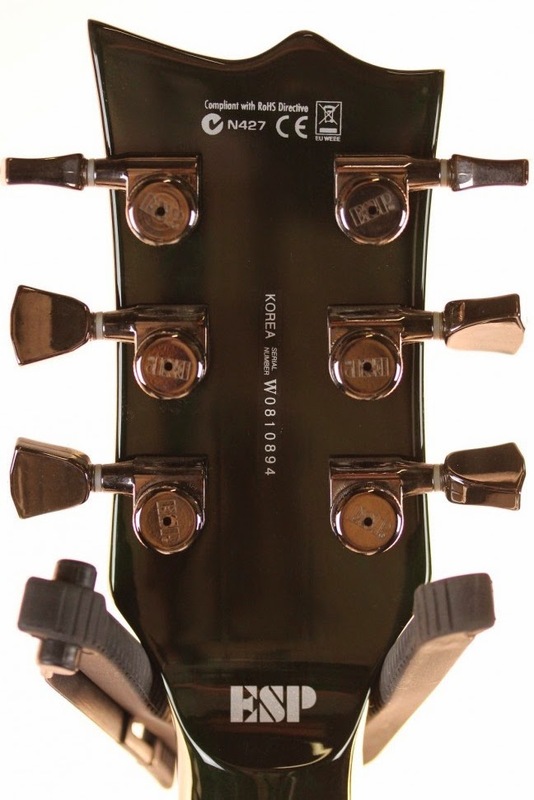 The headstock is equipped with ESP locking tuners that look like Sperzels, again in gold, black or chrome. As I said earlier, you can choose a two totally different flavors of electronics. 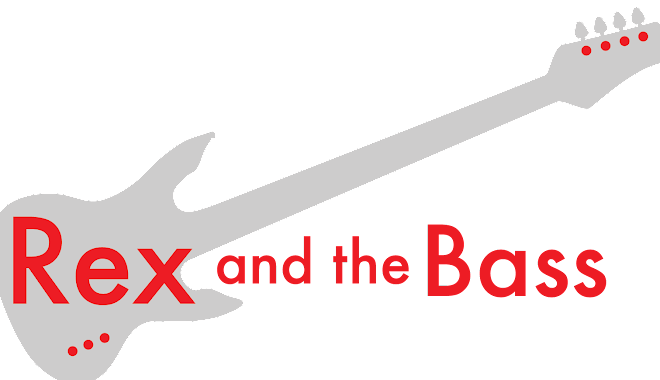 The Seymour Duncan equipped instruments get an SH-4 at the bridge position (like a JB) and an SH-1 at the neck (think 59 PAF Style). The EMG guitars get an 81 at the bridge and a 60 at the neck. Either way the controls are set up the same with two volume controls, a tone knob and a three-way selector switch. I prefer this to the Les Paul 4-knob design. I have had the opportunity to play both versions of this guitar and came away impressed. I could find no visible difference in quality between these Korean-made guitars and the ones that come from ESP’s Japanese shops. The fretwork is very good, and fit and finish are first-rate. Both of these guitars came out of the box with good set-ups and only required tuning before getting down to business. The necks on these instruments have a very fast feel, and are comfortable for extended playing periods. The extra reach is nice if access if the upper frets are needed, and these guitars hang well from a strap with no neck dive despite their lighter weight. I did not miss having a tremolo, though it is something that I do not use terribly often anyway. Since there is no whammy bar the locking tuners are not a necessity, but they sure make string changes quicker! As they always are, the EMGs are as clear as a bell with tons of output. These pickups are always a love them or hate them proposition, and I love the way they sound so they worked out fine. Getting an EC-1000 set-up with these makes for the perfect heavy hard rock/metal guitar. The Duncans are warmer and make all of the appropriate classic rock and blues sounds. Either version of this guitar is a winner, so just pick whichever one you need for task at hand and you will not be sorry. The ESP LTD Deluxe EC-1000 will do anything a Les Paul will do for less than half the price. These instruments have a list price of $1141 and a street price of $799 which includes a one-year warranty and no case. For the money you are not going to find a better rock guitar. Check one out and see for yourself!